Solar technology has come in leaps and bounds, and there is some truly awesome gear on the market today. If you haven’t already seen one, you can get blankets which fold out and act as solar panels. They are similar to a picnic blanket, although a fair bit heavier and with a cable you run to a regulator and then your batteries, to keep the power flowing in. They are super impressive, and do an amazing job at charging batteries, and I can’t wait to see what technology will be out in 10 years. What’s good about a solar blanket? 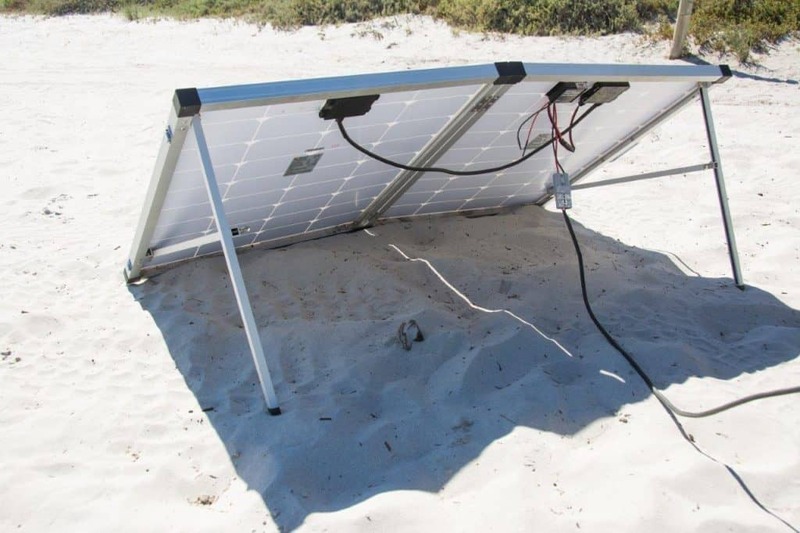 Solar blankets are very portable, less fragile than normal panels, can be packed much easier and work extremely well as a backup or extra panel as the conditions require it. They are also portable, so you don’t have to worry about shade and where you camp – you can just move them into the sun. What’s not good about solar blankets? Unfortunately, we live in a world where some people don’t feel the need to work for their gear; they just take someone else’s. Solar blankets are super easy to steal. They are relatively light, can be folded up under your arm and have no way of being secured. I’ve seen a few of them laid out at camp sites, and wondered how often they get nicked. Normal style panels can be locked to drawbars or towbars if you have to leave them, and they are also much harder to tuck under your arm and walk away with! What makes things even worse is they are extremely expensive when compared to your average monocrystaline panels, so if they do get taken you are going to feel a lot worse off than if it was just a cheap, solid panel. You can get all sorts of different size solar blankets, but I’ve yet to see a way of hanging them in a decent manner. You can put them on your wind screen, bonnet, roof or the floor. None of those solutions work flawlessly. Panels work best when they are facing the sun; how many hours a day does your wind screen face the sun? Probably an hour or two, if you park the car in the right direction. What happens in 2 hours time when the suns moved? Do you turn your car around? I’ve seen these used on wind screens, and you are forever ending up with shadows from snorkels and antennas on your solar, which dramatically reduces their output. If you put it on your bonnet, and you’ve been through mud and grit then you are likely to scratch the paintwork, and on the floor it doesn’t face the sun either, and is at risk of being stood on, or driven over. Now, I understand that these are pretty good at absorbing sun in what ever position they are in, but they can only do so much. When the cheapest 120W solar blanket you can buy is about $220 (with questionable quality), you’ve got to wonder about whether solar blankets are good value for money. If we look at the top end of the scale, you’ll pay $2350 for a 112W Redarc Amorphous Solar Blanket. No doubt these are some of the best quality products on the market, but you pay for it! For that price, you can get 15 and a half 200W normal 12V solar panels. Obviously, you probably don’t need that, but it gives you an idea of how much more expensive they are. Speaking of price, if you are looking at solar panels on eBay, take a read of this – eBay solar panels; how to avoid getting ripped off. Another area that I am keen to see information on is the durability. Folding solar panels and fixed normal panels have proven themselves. 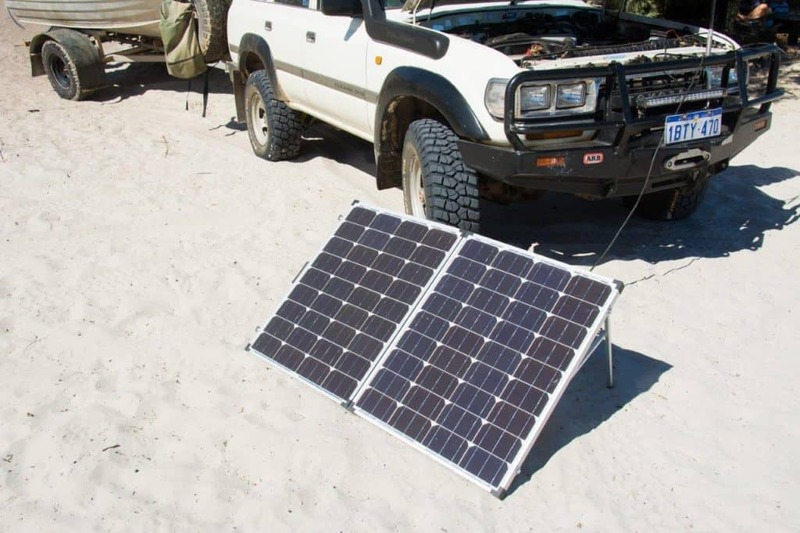 I’ve had 600W of panels mounted on top of my 4WD and camper trailer for several years now, and with some decent bracing they’ve copped with some truly terrible 4WD tracks without any issues. I do wonder how long a solar blanket will last if you are opening and closing it on a regular basis. Only time will tell. If I’m completely honest, I prefer a solar system that does its thing without you touching it, ever. If you can, a fixed solar system that is oversized is the way to go; you never have to set anything up, you never have to monitor battery voltages, and you never have to move anything around to follow the sun. Solar blankets are a bit more user friendly in terms of setup time than a folding panel set, but they certainly don’t involve doing nothing at all. 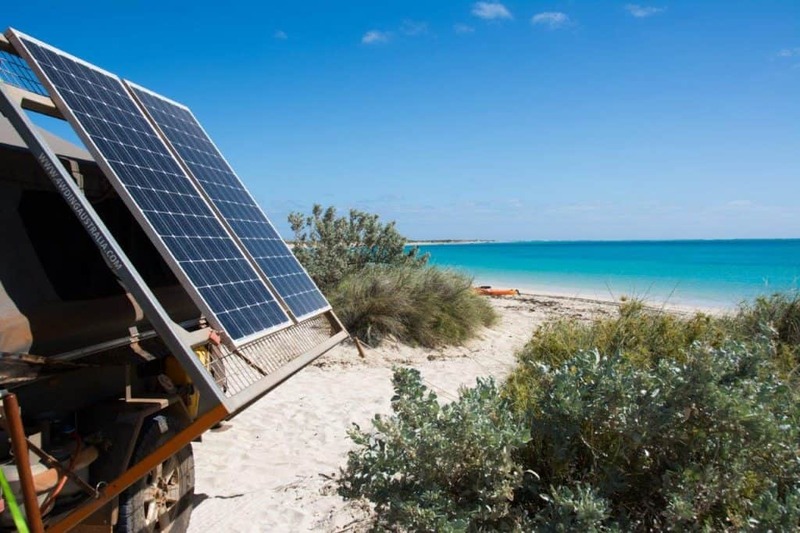 There are pro’s and con’s for portable and fixed solar panels. 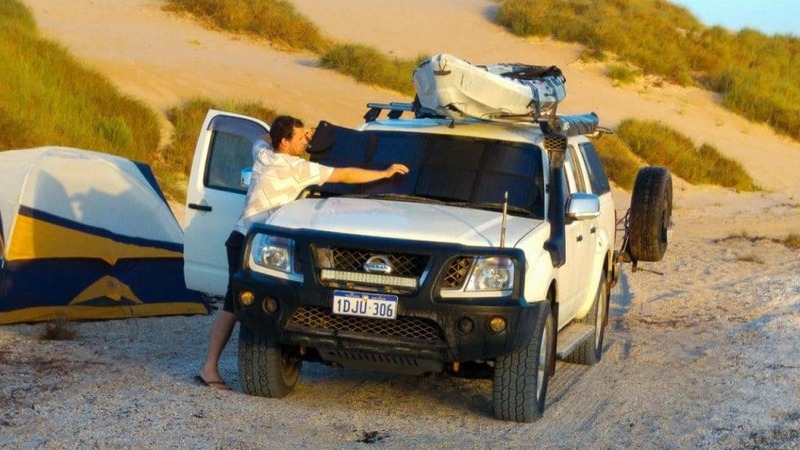 If you want a comprehensive list of things to think about, read this – Fixed or Portable solar panels; which is better? The future is very bright; these will come down in price like normal solar panels have done, and soon you’ll be able to add one to your camping arsenal for a much cheaper price. For some people, they work very well. For us, we’ve gone with permanently mounted panels on the Camper trailer and Dmax, and never have to move or set anything up! If you move regularly, and would be getting folding solar panels anyway, check the solar blankets out; they are pretty amazing bits of kit.